Brugada syndrome is a rare disease characterized by cardiac involvement. It usually results in an acceleration of the heart rhythm (arrhythmia). This intensification of the heart rate can itself result in the presence of palpitations, fainting or even lethal. Some patients may have no symptoms. Nevertheless, despite this fact as well as normalcy in the heart muscle, a sudden change in the electrical activity of the heart can be dangerous. It is a pathology of genetic origin that can be transmitted from generation to generation. The exact prevalence (number of cases of the disease at a given time, in a given population) is still unknown. However, its estimate is 5/10 000. This makes it a rare disease that can be lethal for patients. Brugada syndrome mainly affects young or middle-aged subjects. A masculine predominance is visible in this pathology, without there being any bad lifestyle of underlying. Despite this male predominance, women may also be impacted by Brugada syndrome. This larger number of men with the disease is explained by the different male / female hormone system. Indeed, testosterone, exclusively male hormone, would have a privileged role in the pathological development. This predominance of men and women is hypothetically defined by an 80/20 ratio for men. In a population of 10 patients with Brugada syndrome, 8 are usually men and 2 are women. Epidemiological studies have shown that this disease is found more frequently in men in Japan and in South-East Asia. In Brugada syndrome, primary signs are usually visible before an abnormally high heart rate occurs. These first signs should be identified as soon as possible to avoid complications, including cardiac arrest. The fact that this disease has a hereditary origin and the presence of cases of this syndrome in a family can raise the question of the possible presence of the disease in the subject. Other signs can be challenging when developing the disease. Indeed, nearly 1 in 5 patients with Brugada syndrome have experienced atrial fibrillation (characteristic of a desynchronized activity of the heart muscle) or have an abnormally high rate of heart rhythm. The presence of fever in patients increases the risk for patients of worsening the symptoms associated with Brugada syndrome. Brugada syndrome often leads to sudden cardiac arrest and therefore to the subject’s death. The subjects affected are, in most cases, young people with a healthy lifestyle. The diagnosis must be effective quickly in order to establish a rapid care and thus avoid lethality. Nevertheless, this diagnosis is often difficult to establish from the point of view where the symptoms are not always visible. This explains the sudden death in some children with Brugada syndrome who do not have visible alarming signs. The muscular activity of the heart of patients with Brugada syndrome is normal. The anomalies are located among which in the electrical activity of this one. At the surface of the heart, there are small pores (ion channels). They have the ability to open and close at a steady pace to let the calcium, sodium and potassium ions inside the heart cells. These ionic movements are then at the origin of the electrical activity of the heart. An electrical signal can then propagate from the top of the heart muscle downwards and thus allow the heart to contract and perform its role of “pump” blood. 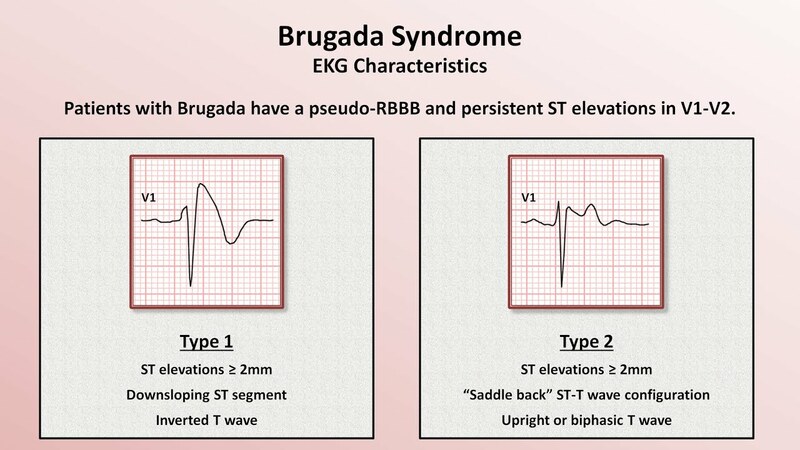 The origin of Brugada syndrome is genetic. Different genetic mutations can be the cause of the development of the disease. The gene most often involved in the pathology is the SCN5A gene. This gene comes into play in the release of information allowing the opening of sodium channels. A mutation within this gene of interest causes a change in the production of the protein allowing the opening of these ion channels. In this sense, the flow of sodium ions is greatly reduced, disrupting the heartbeat. The presence of only one of the two copies of the SCN5A gene makes it possible to cause a disorder in the ionic flux. Or, in most cases, a person affected by one of these two parents who has the genetic mutation for that gene. In addition, other genes and external factors can also cause a disturbance in the electrical activity of the heart muscle. These factors include: certain medications or an imbalance of sodium in the body. The transmission of the disease is via an autosomal dominant transfer. That is, the presence of only one of the two copies of the gene of interest is sufficient for the person to develop the phenotype associated with the disease. Usually, an affected person has one of these two parents who owns the mutated gene. However, in rare cases, new mutations may appear in this gene. These last cases concern subjects who do not present cases of the disease within their family. The risk factors associated with the disease are genetic. Indeed, the transmission of Brugada syndrome is autosomal dominant. Either the presence of only one of the two copies of the mutated gene is necessary for the subject to testify to the disease. In this sense, if one of the parents has a mutation in the gene of interest, vertical transmission of the disease is highly likely. The diagnosis of the disease is based on a differential primary diagnosis. Indeed, it is following a medical examination by the general practitioner, noting the characteristic symptoms of the disease in the subject, that the development of the disease can be evoked. Following this, a visit to a cardiologist may be recommended to confirm or not the differential diagnosis. An electrocardiogram (ECG) is the reference test in the diagnosis of this syndrome. This test measures the heart rate and electrical activity of the heart. In cases where Brugada syndrome is suspected, the use of drugs such as ajmaline or flecainide, can highlight an elevation of the ST segment in patients suspected of having the disease. Echocardiography and / or Magnetic Reasoning Imaging (MRI) may be necessary to investigate the potential presence of other heart problems. In addition, the blood test makes it possible to measure the levels of potassium and calcium in the blood. Genetic tests are possible to identify the possible presence of an abnormality in the SCN5A gene involved in Brugada syndrome. The standard treatment for this type of pathology is the implantation of a cardiac defibrillator. The latter is similar to a pacemaker. This apparatus makes it possible, in the event of an abnormally high beat frequency, to deliver electric shocks enabling the patient to regain a normal heart rhythm. Currently, no drug treatment exists for the treatment of the disease. In addition, some measures can be taken to avoid rhythmic disorders. This is particularly the case of the eviction of diarrhea (impacting the sodium balance in the body) or even fever, by taking appropriate drugs.